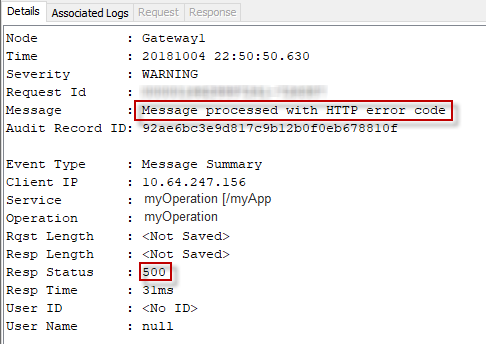 In the Gateway Audit Events, if you see the “Message processed with HTTP error code” and status code "500" on the Details tab of an event, this means the http response code was 500 - Internal Server Error. This means that the API Gateway was able to process the request and then route the request onto the backend service, and the backend service responded with HTTP 500 response. In this scenario, the cause of the fault is not the API Gateway. Instead, the issue is with the backend service.